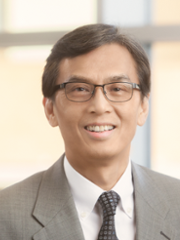 Dr. Zhen’s research efforts are primarily focused on participating in clinical trials, mainly corporative trials such as NRG, ECOG, NCCTG and industry sponsored clinical trials, etc. We will also start a new trial here testing BMX for HNC patients. PI: W. Ken Zhen, M.D. Krishnamurthy J, Baker JJ, ZHEN W, Lydiatt D, Ganti AK. Salivary duct carcinoma responding to trastuzumab based therapy: a case report and review of the literature. Head & Neck, 35(12);E372-5, 2013. Ganti, AK, West WW and ZHEN W. Current Concepts in The Management of Small Cell Lung Cancer. Indian J Med Res 137;1021-1238, June 2013. Han G, Liu, D, Gan H, Denniston KA, Li S, Tan W, Hu D, ZHEN W, Wang Z. Evaluation of the Dosimetric Feasibility of Hippocampal Sparing Intensity-Modulated Radiotherapy in Patients with Locally Advanced Nasopharyngeal Carcinoma. PLOS ONE 9(2): e90007. Feb 2014. Zhang Q, Zheng D, Lei Y, Morgan B, Driewer, Zhang M, Li S, Zhou S, ZHEN W, Thompson R, Wahl A, Lin C, Enke C. A new variable for SRS plan quality evaluation based on normal tissue sparing: The Effect of Prescription Isodose Levels. BJR 87:1-10, 2014. Wang RZ, Ma L, Hu Y, Wang D, Qin Y, Liu K, Chang C, ZHEN W, Yu J. Prognosis and long-term outcomes of nasopharyngeal carcinoma in Han and Uyghur patients treated with intensity-modulated radiotherapy in Xingjiang Autonomous Region of China. PLOS ONE, Nov 6;9(11) 11145, 2014. Verma V, ZHEN W. Treatment Costs of Early-Stage Lung Cancers Detected by Low-Dose Computed Tomorapy-Screening. Int J Radiat Oncol Biol Phys, 93(1) 207-8, 2015. Verma V, Talmon GA, ZHEN W. Intracardiac Metastasis From Non-Small Cell Lung Cancer. Frontiers in Oncology. 5:168, 2015. Ganti AK, Shostrom VS, Alorabi M, ZHEN W, Marr A, Trujillo K, KM Monirul Islam, Lackner R, and Kessinger A. Early stage non-small cell lung cancer in octogenarian and older patients: a SEER database analysis. Clinical Lung Cancer. 15:277-8, 2015. Verma V, Simone CB, and ZHEN W. Stereotactic Radiotherapy for Stage I Small Cell Lung Cancer. The Oncologist. 21:1-3, 2016. Verma V, Shah C, Lautenschlaeger T, Lin C, Beriwal S, ZHEN W, Mehta MP, Zietman AL. International Medical Graduates in Radiation Oncology: Historical Trends and Comparison with Other Medical Specialties. Int J Radiat Oncol Biol Phys, 95(4):1102-06, 2016. Dhir M, Melin AA, Douaiher J, Lin C, ZHEN WK, Hussain SM, Geschwind JH, Doyle MB, Abou-Alfa GK, Are C. A Review and Update of Treatment Options and Controversies in the Management of Hepatocellular Carcinoma. Annals of Surgery. Ann Surg, 263(6):1112-25, 2016. Zhang D, Zhu XF, Zhang QH, Liang XY, ZHEN W, Lin C, Verma V, Wang S, Wahl AO, Yu L, Zhou S, Zhang C. Target Dose Conversion Modeling from Pencil Beam (PB) to Monte Carlo (MC) for Lung SBRT. Radiation Oncology, 11(83):1-13, 2016. Han G, Bi J, Tan W, Wei X, Wang X, Ying X, Guo X, Zhou X, Hu D, and ZHEN W. A Retrospective Analysis I Patients with EGFR-mutant Lung Adenocarcinoma: Is EGFR Mutation Associated with a Higher Incidence of Brain Metastasis? OncoTarget, 7(35):56998-57010, 2016. Verma V, ZHEN W, and Panwa A. Radiation Therapy for Neck Metastases. Medscape Drugs & Disease., 2016. Bennion NR, Malouff TM, Verma V, Denniston K, Bhirud A, ZHEN W, Wahl A, Lin C. A Comparison of Clinical and Radiologic Outcomes Between Frame-based and Frameless Stereotactic Radiosurgery for Brain Metastases. Practical Radiation Oncology. 6(6) 283-90, 2016. Shrestha R, Bhatt VR, ZHEN W, and Ganti AK. Nasopharyngeal Carcinoma in Pregnancy: A Case Series and Literature Review. Cancer Treatment and Research Communications. 9:126-30, 2016. Zhou S, Zhu X, Zhang M, Zheng D, Lei Y, Li S, Bennion N, Verma V, ZHEN W, and Enke C. Estimation of internal organ motion-induced variance in radiation dose in non-gated radiotherapy. Phys. Med. Biol. 61:8157–79, 2016. Verma V, Shostrom V, Kumar S, ZHEN W, Hallemeier C, Braunstein S, Holland J, Harkenrider M, Ishkanian A, Neboori H, Jabbour S, Attia A, Lee P, Alite F, Walker J, Stahl J, Wang K, Bingam B, Hadzitheodorou C, Decker R, McGarry R, and Simone C. Multi-Institutional Experience of Stereotactic Body Radiotherapy for Large (≥5 Centimeter) Non-Small Cell Lung Tumors. Cancer. 123(4):688-96, 2017. Verma V, Simone CB, Allen PK, Gajjar SR, Shah C, ZHEN W, Harkenrider MM, Hallemeier CL, Jabbour SK, Matthiesen CL, Braustein SE, Lee P, Dilling TJ, Allen BG, Nichols EM, Attia A, Zeng J, Biswas T, Paximadis P, Wang F, Walker JM, Stahl JM, Daly ME, Decker RH, Hales RK, Wilers H Videtic GMM, Mehta MP, Lin SH. Multi-Institutional Experience of Stereotactic Ablative Radiotherapy for Stage I Small Cell Lung Cancer. Int J Radiat Oncol Biol Phys, 97(2):362-371, 2017. Verma V, Shostrom V, ZHEN W, Zhang M, Braunstein S, Holland J, Hallemeier C, Harkenrider M, Ishkanian A, Jabbour S, Attia A, Lee P, Wang K, Decker R, McGarry R and Simone C. Influence of Fractionation Scheme and Tumor Location on Toxicities Following Stereotactic Body Radiotherapy for Large ( ≥5 Centimeter) Non-Small Cell Lung Cancer: A Multi-Institutional Analysis. Int J Radiat Oncol Biol Phys, 97(4):778-85, 2017. Mao B, Verma V, Zheng D, Zhu X, Bennion N, Bhirud A, Poole M, and ZHEN W. Target migration from re-inflation of adjacent atelectasis during lung stereotactic body radiotherapy. Would J of Clin Oncol, 8(3)300-304, 2017. ZHEN W, Denniston KA, Li S, and Thorell WE. Spatial Displacement of a Single Brain Metastasis after Corticosteroid Treatment and its Impact on Stereotactic Radiosurgery Planning and Delivery. Int J Radiol Radiat Ther, 4(2): 00091, 2017. Ying X, Wang MW, Verma V, Wang MX, Ye S, Bi J, Zhou XY, Han G, and W ZHEN. Metastatic spread of solid subtype lung adenocarcinoma to the small intestine with anemia and melena; A case report. Medicine Medicine, 96:34(e7768), 2017. Zhou C, Bennion N, Ma R, Liang X, Wang S, Zvolanek K, Hyun M, Li X, Zhou S, ZHEN W, Lin C, Wahl A, Zheng D. A comprehensive dosimetric study on switching from a Type-B to a Type-C dose algorithm for modern lung SBRT. Radiat Oncol. 12(1):80. doi: 10.1186/s13014-017, 2017. Zvolanek K, Ma R, Zhou C, Liang X, Wang S, Verma V, Zhang Q, Driever J, Lin C, ZHEN W, Wahl A, Zhou S, Zheng D. Still equivalent for dose calculation in the Monte Carlo era? A comparison of free breathing and average intensity projection CT datasets for lung SBRT using three generations of dose calculation algorithms. Med Phys, 44(5):1939-1947, 2017. Baine M, Bennion N, Malouff T and ZHEN W. Osteosarcoma of the larynx: treatment outcomes and patterns of failure analysis. Rare Tumors, 24; 9(1): 6955, 2017. Baine M, Dorius T, Bennion N, Alam M, Smith L, ZHEN W, Ganti A. Chemoradiotherapy for Locally Advanced Squamous Cell Carcinoma of the Oropharynx: does completion of systemic therapy affect outcomes? Oral Oncol. 73:105-110, 2017. Baine M, Dorius T, Bennion N, Smith L, ZHEN W, Ganti A. Weight loss and PEG-tube placement during chemoradiotherapy for locally advanced cancer of the oropharynx do not negatively impact outcomes. Frontier in Oncology, 7:299, 2017. Anderson C, Sonis S, Lee C, Adkins D, Allen B, Sun W, Agarwala S, Venigalla M, Chen Y, ZHEN W, Mould D, Holmlund J, Brill J and Buatti J. Phase 1b/2a Trial of The Superoxide Dismutase Mimetic GC4419 to Reduce Chemoradiotherapy-induced Oral Mucositis in Patients with Oral Cavity or Oropharyngeal Carcinoma. Int J Radiat Oncol Biol Phys, 100(2):427-35. 2018. Post C, Verma V, Lin C, ZHEN W, National Practice Patterns for Clinical T1N0 Nasopharyngeal Cancer in the Elderly: A National Cancer Data Base Analysis. Anticancer Research, 2018 in press.